Another easy and tasty polenta recipe – this time using flavored, cheesy polenta to make a crust which is then filled with a mix of Zucchini, Thyme and Pancetta! Delicious! Bring the gluten free vegetable stock to a boil. Season it with salt and pepper. 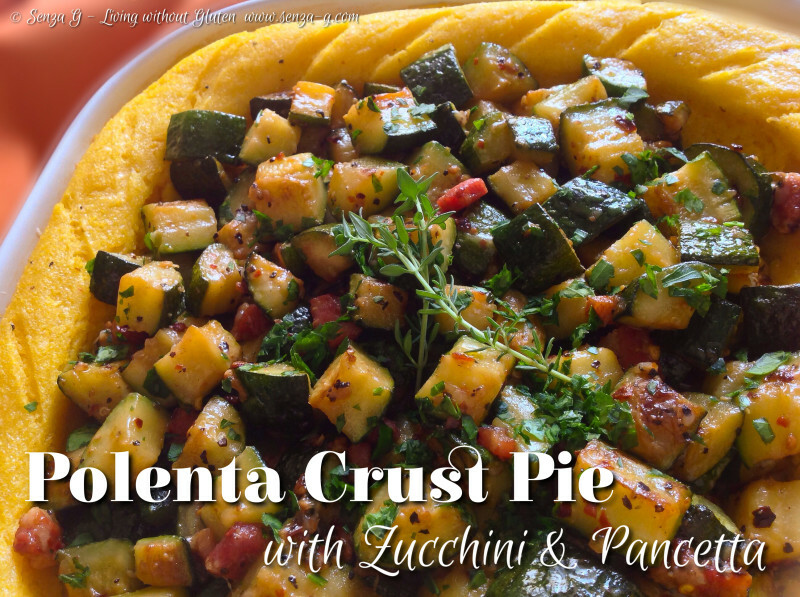 Remove from the heat and start pouring the polenta in a shower, whilst whisking to avoid lumps. It will start to thicken. Put it back on a very low flame and cook for a few minutes or as directed on the package. Add a knob of butter, the grated Parmesan and the nutmeg, stirring well. Using a wooden spoon, pour the polenta in a lightly greased oven proof dish. Spread it over the bottom and up the sides to form a thick crust. Wetting the spoon with water occasionally will help in smoothing out the polenta. Make slashes on top of the crust with a sharp knife. Brush the top of the crust with a little melted butter and place in the oven. Bake for about 20 to 30 minutes or until it starts to turn golden. In the meantime, fry the diced zucchini in a little olive oil, together with the garlic, the teaspoon of gluten free stock powder and thyme. Add the pancetta and cook for another ten minutes. Stir in the grated cheese and season with salt and pepper. Take the pie crust out of the oven, and pour the filling in the centre, sprinkle with freshly chopped parsley, garnish with some thyme sprigs and serve.